Today we just completed our 9th day of writer’s workshop. I get a lot of questions about writer’s workshop, so I thought I would answer some questions and show you where we are! How can you teach students to write when they don’t know their letters and sounds? I believe that students can compose even without words. I want my students to know they have a story to tell. When they come busting into your classroom to tell you about when they wrecked their bike at home, they have a story to tell. After all… writing is just telling on paper! If you look at stories like Pancakes for Breakfast by Tomie DePaola, Good Dog Carl, by Alexandria Day, and No, David by David Shannon, you will notice rich stories that are told with little or no words. The illustrations carry the story. So my students begin to tell stories with pictures. Over time, their transcription skills will develop and we will see letters and sounds. Do you tell the students what to write? During writer’s workshop, students self-select a topic to write about. This is not journal prompt writing time. This is not reading response writing time. 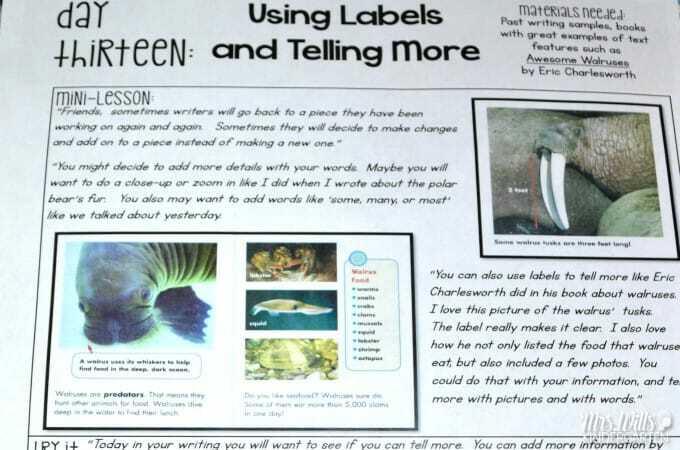 Writer’s workshop is a time for students to write on the subject of THEIR choice. I may suggest (as the year progresses) that they write in a certain genre, but I rarely insist that they do. For example: If we are knee-deep in an informational text writing unit, I may request a student write in that genre. Generally, whenever I start a new genre study, the majority of my students just naturally start to write in that genre. How do you get them to sit and write? I expect it. I tell my students that the work we do in writers workshop is so important that nothing should distract us from it. We start small and grow from there. How often do you do writers workshop? Everyday. We rarely miss it. So, yes… I give about 170 mini-lessons a year! It helps to write in full view of your students. True story! I broke my arm when I was in grade school… or as one of my kiddos pointed out “in the olden days.” I am not really sure how old he thinks I am! Here are a few student samples to show you the progress we have made in just a short time. Her writing on 8/28 is much more focused and clear. She is even starting to write some sounds. I am not in a hurry to have letters on the page. I am more interested in having them work on telling their story and making the meaning clear to the reader. 8/29 I am in my house and it is raining outside. You can see me in the window looking out. I don’t like the rain. His writing has also improved in clarity. He has written some letters at the top (on the 8/29 piece). But they appear to be just random letters. That is AWESOME! He knows letters mean something! That is progress too! It appears that Spiderman is a creeper in each of his drawings! NOTE: I did not include them all! Showing growth in writing takes time. I have heard it compared to watching a tree grow. You can’t force it to grow. However, I am confident if I provide the opportunity and nurture the process, growth will happen. You can learn more about our writing with emergent writers. It includes over 160 writing mini-lessons that will take your students where they are and turn them into phenomenal writers by the end of the year. Since I LOVE talking about writing, I have a few (dozen) blog posts about writing. LOOKING FOR PRINT AND TEACH WRITING LESSONS? Deanna Jump and I have created simple, yet powerful daily lesson plans to teach writers workshop. We have taken the guesswork out of your instruction. Each unit is carefully planned out. And it walks you through each day’s lesson. Previous Post: « Assessment Free Trial and GIVEAWAY! i am starting your writer's workshop next week! i've been researching a lot – i am a little nervous, but also excited! when you model drawing/writing at the beginning, do you use phonetic spelling? how does that progress throughout the year? Ok… you can see we shared the pen in my samples. Here is my direction, "Just write the sounds you hear." Mercy… they BEG for me to tell them if they are right or not. I just shrug and force them to be "brave and fearless." Then I celebrate their correct sounds with the check marks. 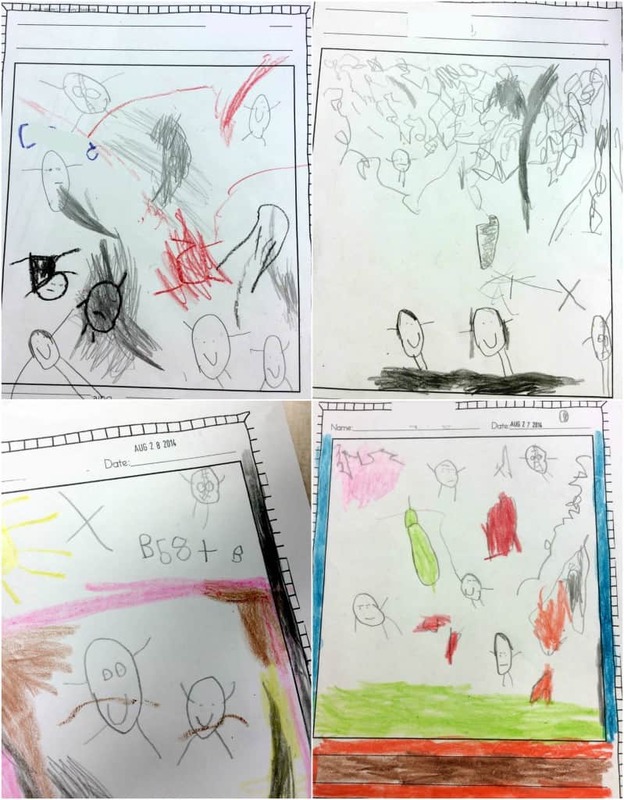 In your drawings, did the students do the writing and if so, did you tell them what words to write? I see that you wrote what they dictated on their pieces. How long will you do that and do they get dependent on you for that? I see some kindergartners every year who don't try writing knowing that the teacher will write it for them, especially the strugglers. Yes, we shared the pen. As a class we decide what a good sentence would be. We practice it several times, then I pull names out of a cup for students to come up to write. If you notice what I wrote on their piece is a scribbled version. Ha! I can barely write it. It is for me. I want to see what their idea of composing is. As the days progress, I will no longer do this and transfer my notes to my conferring notes. It is much easier for me to do that once they start writing books. Do you do the check marks on their individual written pieces or just shared writing pieces? I teach 4K and we spend a lot of time at the beginning of the year focusing on telling stories through their drawings and making complete thoughts. I will sometimes put check marks on a students page, but only rarely. I usually don't until mid-year and only when I want to draw attention to letter/sound skills. I agree with you… right now we are focusing on drawings and complete thoughts. I know the rest will come! I love this post! It gets me excited for Writer's Workshop! LOVE the olden days picture- ha! and the kite flying… <3 Have a great year! We start with kids this Wednesday. ohhh…. so exciting!!! Have a GREAT year!!! Rest up over the long weekend (even though I am sure you are working, working, working). These are terrific! I love the progression and it helps inspire me for ideas for writer's workshop! Thank you! Only 165 more mini-lessons to go! I love that spidey makes an appearance in each picture! I really should start doing this with my Autumn. she loves drawing. I need to see what her "Stories" are for each picture! Great post! I'm always reading your blog, love it! I just bought the pack you co-wrote with Deanna Jump. Can't wait to get started on it. Dee Dee…Can you please direct me to your post that explains how you introduce and model each literacy station? I printed out your station cards and hope to introduce the work station board tomorrow. Thank-you! I'm not really sure if I have ONE post that explains it. I do review a few stations each day. Like the writing and overhead station… they are going to be using this station all year. So the first day I might say, "This is the writing station and you will write just one page while you are here." The next time (a few days later) I might point out something else at the station… guess what? I still might be spending 1-2 minutes reviewing this station in November, February… Here is why. Some students are ready to hear all the bells and whistles on day 1, some are not ready to hear them until much later, so I spirally review my stations throughout the year. I keep the tasks super easy the first few weeks and I move about the room supporting and reteaching. I never sit down on one day and explain them all. After the 2nd station, they are done listening.. Ha! You can look on the tab that says "My Classroom" for some posts that might help. I love Writers Workshop. It is my favorite part of the day. We were just told our kindergarteners are expected to b able to write a story with 8 sentences by the end of this year. We have never had to do this before. Are your students able to do this at the end if the year? Hi Lori! I know it sounds like a mountain! But honestly, we had no problem meeting this expectation. At the beginning of the year, your mind says NO WAY! With the writing program that Deanna and I designed, students move into writing books. These books are 3-4 pages long (or longer if they want). The students write multiple sentences on each page. SO it can totally happen if you offer focused instruction. Can everyone do it? Perhaps not. In my district, most of my students came in with zero letter sound identification and they did not know many letters. But by May, 80% of them were meeting this expectation. The other 20% had made terrific gains and I was equally pleased with them. I was looking at the writing pack that you and Deanna Jump made. I am considering buying it. Are there lesson plans for the entire year? Does it tell you what to do each day? Do you do a mini lesson every day? Yes! Yes! Yes! and Yes! Ha! Yes, there are daily (scripted lessons). Now, I am not HUGE fan of scripted lessons, but these will get you on your way. Then, over time, you will make it your own! Yes, the mini-lessons tell you what to do each day and there is a mini-lesson for each day. This link in the blog didn’t work, where is says writing with emergent writers. 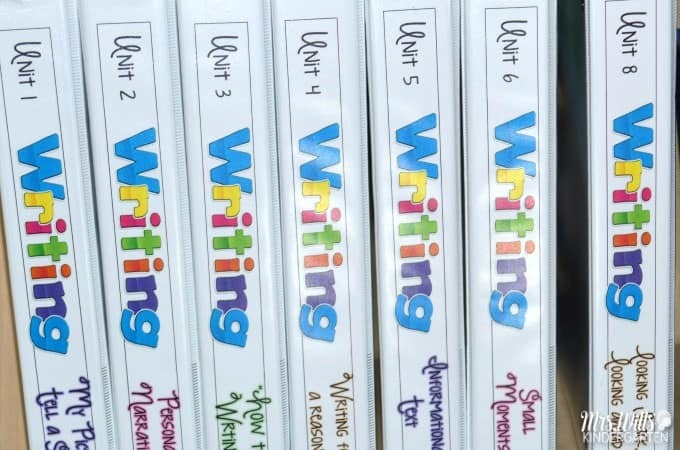 Is this the Writing Writers Workshop Bundle? I am not a writer myself and am completely intimidated to teach writing even to 5 year olds. I need something precise to follow that will help not leave any little ones behind. Hi, I absolutely love your ideas and I will definitely be purchasing the bundle!! Quick question, do you underwrite after the student has written about their picture? Hi there! Thank you so much!!! No, I do not underwrite on their paper. Can you give an example of a mini lesson? Do children “write” about what was discussed in the mini lesson? If so, how do students choose what to write about? I think I’m confused. Thank you for your help! The mini-lessons really focus on changing the writer. For example, the mini-lesson might be on adding details to the drawing of the characters in their story. Students would then apply this to their OWN writing. I never tell my students what they are going to write about. The classroom I’m going to be in doesn’t do writing workshop currently. In your opinion, should I start writing workshop with them or wait until next year when I can implement it from the beginning? I would honestly start! You will still see tremendous growth by starting now. Perhaps right when you come back from winter break since you will be revisiting routines anyhow.